On Friday, July 22, as the stifling heat and humidity of summer relented for just a fleeting few days, hundreds of people filled a hall at Enkakuji Temple in Kamakura, Kanagawa Prefecture, to listen to a lecture by philosophy scholar Alfons Deeken. German-born Deeken, a professor emeritus at Sophia University in Tokyo, and long a leading promoter of death education in Japan, told the audience in lively, fluent Japanese that the more you think about your own death, the more you realize how precious your life is — and so the more you will live your life to the full. “I have been a member of various health ministry committees,” the 79-year-old professor said rather solemnly. 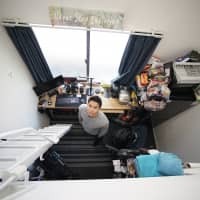 “And according to the ministry’s statistics, the mortality rate of Japanese people is 100 percent.” It was his way of stressing that everyone has to face death. 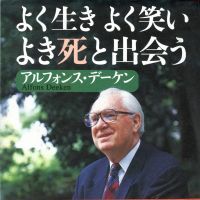 Deeken, who is honorary chairman of Sei to Shi wo Kangaeru Kai (the Japanese Association of Death Education and Grief Counseling), which he founded 1983, then went on to emphasize that learning about death and dying is not a depressing pursuit, but one that leads to a fuller appreciation of life. 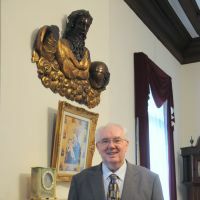 During his childhood in wartime Germany, Deeken often encountered death in his family and among his friends, including those who were victims of Allied bombing. However, such experiences — as he explains in one of his books, titled “Yoku Iki Yoku Warai Yoki Shi to Deau” (“Good Living, Good Humor, Good Death”) — led him to choose thanatology (the study of death) as his life’s work. 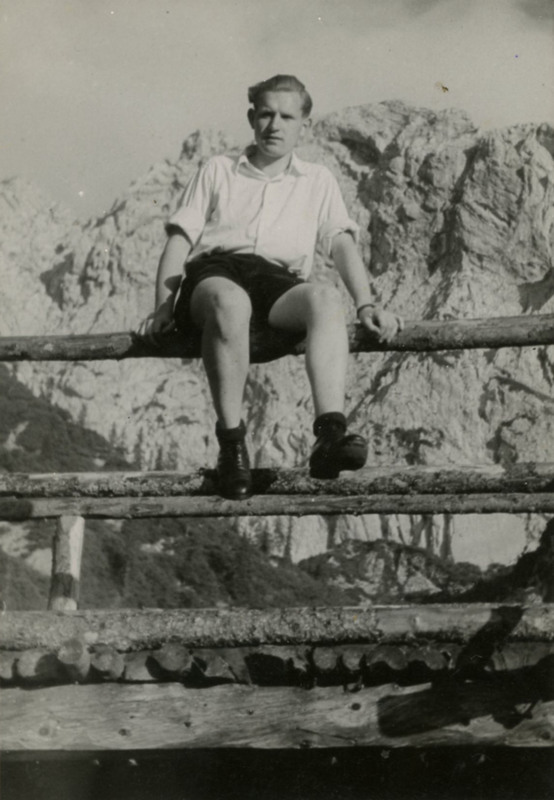 Born in 1932 as the third child of a pious Catholic father who was a real estate agent and farmer in Emstek in the northern German state of Lower Saxony, young Deeken helped his anti-Nazi father in various ways, including typing for secret distribution many copies of a speech by a bishop criticizing the regime. 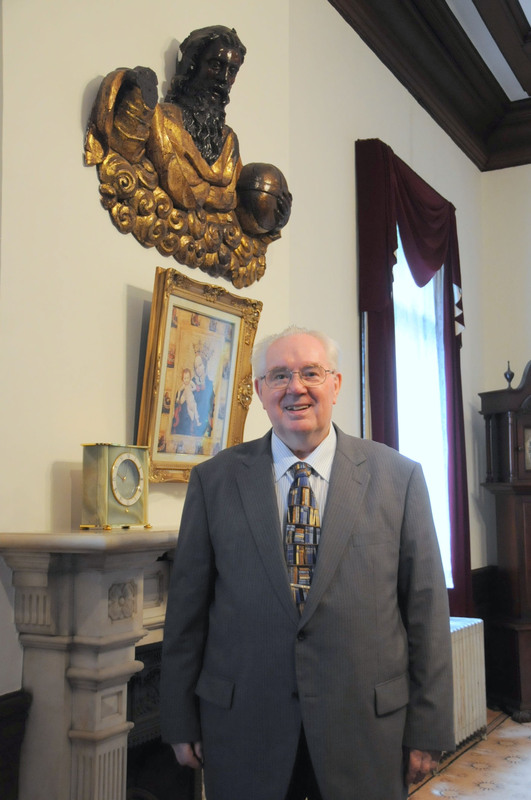 After war’s end in 1945, the then teenage Deeken threw himself into the world of books, and it was after he read a biography of St. Francis Xavier that he decided to become a Catholic priest. So, after graduating from high school, he entered the Society of Jesus (the Roman Catholic, all-male, evangelizing Jesuits) in Germany before studying German literature in Austria and then gaining a master’s degree in philosophy from a university in Munich. 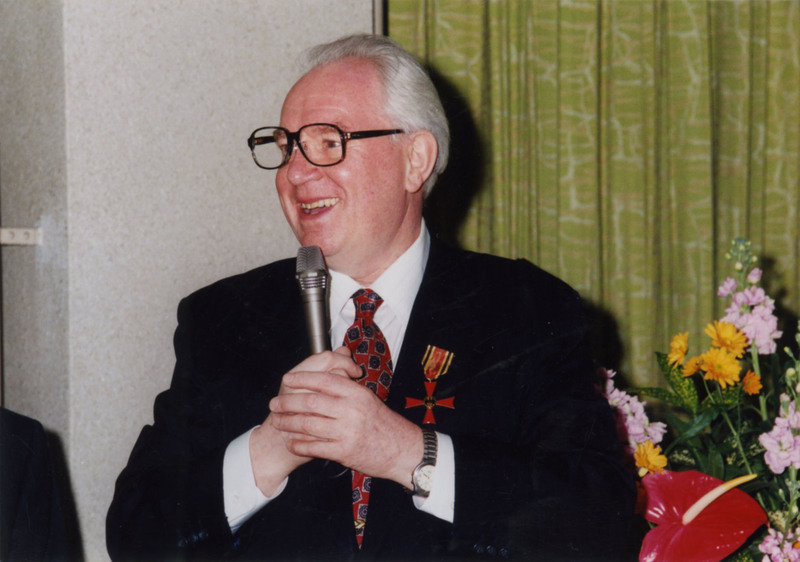 Following the award of his doctorate, in 1973 Deeken started teaching philosophy at Sophia University, including a course titled Shi no Tetsugaku (Philosophy of Death) in 1977. 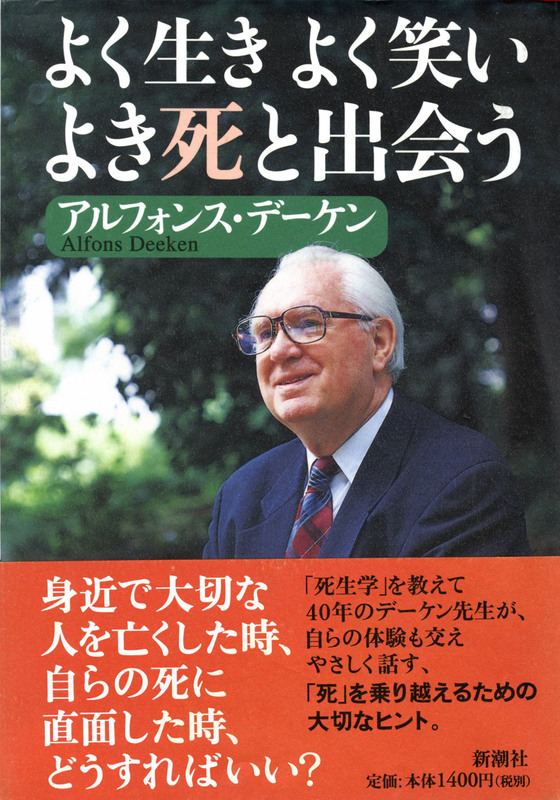 Besides all this and the association he founded in 1983, Deeken has actively promoted death education among the general public and has had about 30 books published in Japanese about death, dying, bereavement and grief — some of which were translated into Korean and Chinese. 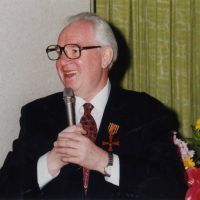 Deeken has received many awards for his promotion of death education, including the highly prestigious Kikuchi Kan cultural award in 1991 and the Cross of the Order of Merit of the German Federal Republic in 1998. Now, although he retired from the university in 2003, Deeken is still busy lecturing on life and death all around Japan. He did, however, find time to meet with The Japan Times at Sophia University on July 19. Let me ask you about your background. What made you start thinking deeply about death? I began thinking about death at an early age. When I was 8, I experienced the death of my young sister from leukemia. In grade school, I experienced many deaths during the Allied bombings in northern Germany in World War II. Some of my classmates were burned to death before my eyes in incendiary attacks. 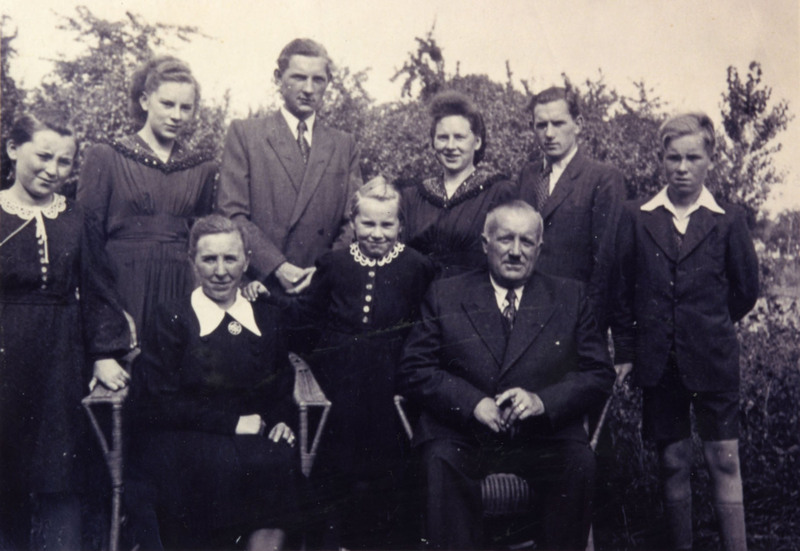 On the last day of WWII, my grandfather, who had risked his life in the anti-Nazi movement, was standing in front of our house, waving a white flag welcoming the Allied troops. He was shot in front of my eyes by the first arriving Allied soldier. Through all those experiences, I began to think deeply about death, and make a distinction between an unavoidable death, as in the case of my younger sister, and avoidable deaths brought about by the warmongering of Germany’s irresponsible Nazi government. In retrospect, an important inspiration for choosing the philosophy of death and death education as my academic life’s work came from my sister Paula, who died at home at age 4. She had been told by her doctor and by our parents that there was no cure for her leukemia and that she would have to face death soon. At that time there was no cure for leukemia. In our family there were eight brothers and sisters, so we took turns sitting at the bedside of our dying sister. She amazed all of us with the way she faced her approaching death. As children of pious Catholic parents we had, of course, been told that for Christians death is not the end of everything but the gate to heaven. Our sister surprised us on her last day when she shook hands with everybody and simply said “I shall see you again in heaven.” That enormous spiritual energy of hope was the testament of our dying sister to her parents and her seven brothers and sisters. As a student of philosophy in Munich, I spent some time working as a hospital volunteer. Once a doctor asked me to be with a dying patient who would probably have three hours to live. He was a refugee from a country in eastern Europe who had no relatives in Germany. When I went to his bedside he was still conscious. I asked myself what a dying patient might want to talk about. The usual conversation on topics like politics, sports or weather would certainly not be of interest to a dying person. However, I felt that the dying man had given me, as a final gift, the chance to make an important decision about my life’s work. Since there was not much to talk about, we both decided to spend the last half-hour in prayer. The patient died asking God to receive him into heaven. The man died peacefully about three hours later, but they seemed like the three longest hours of my life. 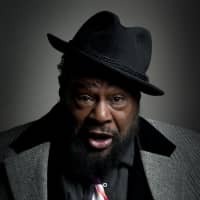 I was challenged to think deeply about life and death and, during that time, I made an important decision — namely, to make studying the philosophy of death my life’s work. What brought you to Japan in 1959? That young Japanese inspired me to follow my own conscience rather than accept the recommendation of my principal. At that time I felt a great desire to visit the country that had produced such a courageous boy. When you came to Japan, were you a student of the language? Yes. And then I studied in the theology department of Sophia University for four years. I became a priest here in Japan. So I am a priest made in Japan! After becoming a priest, you went to New York to study philosophy. Was that especially philosophy related to death? Yes. I studied at Fordham University for my Ph.D. in philosophy, and I also attended the annual congresses of associations concerned with death education and visited many hospices. Then in 1973, I came back to Japan and started to teach at Sophia. You founded the Japanese Association for Death Education and Grief Counseling in 1983. What led to that move? In November 1982 at Sophia, I organized a seminar on death and dying for 800 participants. Many of those who attended urged me to continue the seminar on a regular basis, and that led to my founding the association. The association has three goals: to promote death education; to improve terminal care in hospitals and develop more hospice programs; and to establish mutual support groups for grieving people who have lost a loved one. At the time of the foundation of the association, death was still considered a taboo in Japan. Consequently, there was practically no education about death, dying, bereavement and grief. I consider grief education as an essential part of death education. Also, the hospice movement was still at an early stage — in fact, when I did the first lecture there was only one hospice in Japan. Now there are 200. You have promoted death education in Japan. Please explain why teaching and learning about death is so important? I have published 33 books in Japanese. Most of them are about death, dying, bereavement and grief. 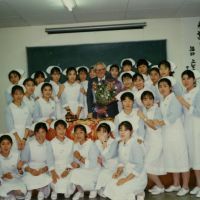 I have also given numerous seminars and hundreds of lectures on death education in medical schools and nursing schools. As for the general public I am convinced that medical doctors and nurses will be more qualified to assist dying patients if they have received education about death and dying. Numerous Japanese have told me that death education and grief education had helped them greatly in facing the death of a loved one and in confronting their own approaching deaths. There are quite a number of books published in Europe with titles such as “The Art of Dying.” If dying is not a mere passing away, but an art, death education can help us to learn about achieving one’s own death. Indeed, the German poet Rainer Maria Rilke has reminded us of the danger of “mass-production death” in European hospitals. 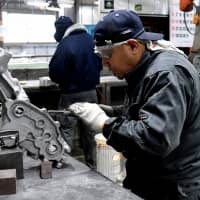 What does “mass-production death” mean? In factories, cars are all produced in the same way. In hospitals, everybody passes away in the same way. That’s wrong, the poet Rilke said. Individuals have to face their own life but also their own death — not only the passive way of passing away, but also the active way of confronting death. In recent years, I have noticed that Japanese funeral directors show great interest in death and grief education. I am frequently invited to give lectures to them on these topics. What did you talk to the funeral directors about? It’s very important how they treat bodies. The (2009 Oscar-winning) film “Okuribito (Departures)” shows the right way to deal with bodies. How have public attitudes toward death and dying changed in Japan in the past 30 years? They have changed and improved in many ways. One example of this concerns telling the truth to cancer patients. When I was on a health ministry committee that wrote guidelines for Japanese hospitals 25 years ago, doctors would usually not tell cancer patients about their illnesses. None of the Japanese members of the committee suggested that they should change that approach, but I suggested that it was desirable to tell a cancer patient the truth. Why do you think doctors at that time didn’t tell the truth to cancer patients? Well, many doctors were afraid to tell them because they worried that their patients may commit suicide. That was one reason, but also many doctors simply didn’t want to admit they couldn’t cure their patients, which they regarded as a failure of their profession. So they usually tried new therapies or another test. But the mortality rate in Japan is 100 percent, like everywhere — everybody dies. So, sooner or later doctors have to admit that they cannot cure a patient, but it is very painful for them to do so because they are told at medical schools not to admit they cannot cure a patient. But that has changed quite a bit. Today, when I talk to doctors in many areas of Japan after I have given a lecture to them, most say they are telling the truth to cancer patients. I believe it is important that a cancer patient can make his or her own decision as to where they want to spend the last days of their life. Nowadays, terminally ill patients have three choices. One is to spend their last days in a general hospital, where medical staff are solely concerned with the prolonging of life. The second choice is to go to an institutional hospice. And the third choice is to stay at home, which is called the “home-care hospice” option. In Japan, most people now live to be 80, but surely this new longevity comes with complications. One of the great achievements of Japanese medical technology in the 20th century was to make possible a great extension of the average Japanese person’s lifespan. In fact, Japanese people have had the highest life expectancy in the world, and Japanese men now live longer than German males. So, as I have chosen to live in Japan, and I eat natto (fermented soybeans) every morning, perhaps that might help to extend my lifespan. However, as life expectancy has increased it has raised the question of how to spend a longer life in a meaningful way. With a longer life there is also a greater probability that we will have to face various illnesses. I myself had a malignant colon cancer in 1995. Thanks to the skillful operation I underwent at Joshi Idai (Tokyo Women’s Medical University) Hospital my cancer was successfully treated and I have enjoyed fairly good health since. I have often been asked about my reflections on my cancer experience and the surgery. I usually answer that I would rather not have cancer again. Nonetheless, I feel my cancer experience was a positive thing, because when I meet cancer patients I feel my experience helps me to understand a little better what they are experiencing. What do you think of developments in terminal and palliative (pain-reduction) care in Japan in the past decades? There has been a great improvement in terminal and palliative care in Japan. Cancer patients here benefit enormously from 200 hospices as well as from the numerous palliative-care units in general hospitals. A considerable number of hospice volunteers also contribute considerably to improving the quality of life of dying patients. 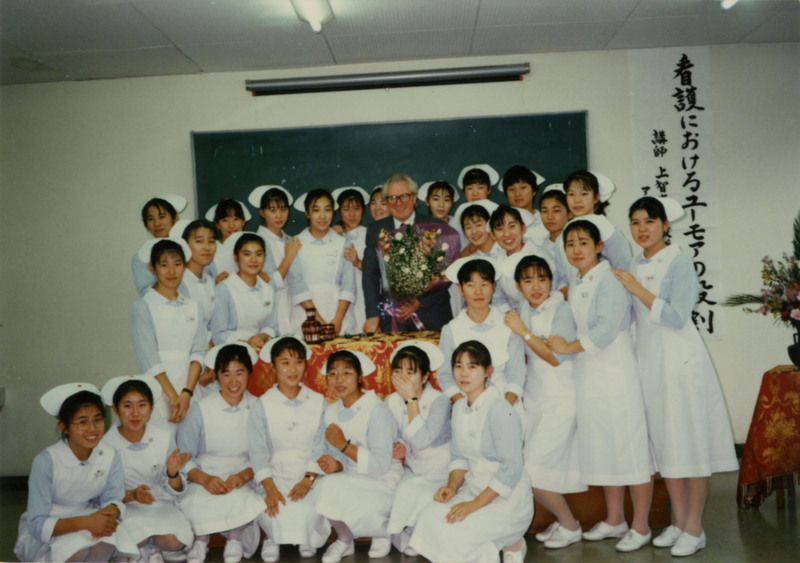 Indeed, for many years I have organized a six-month course at the community college of Sophia University on hospice volunteering and death education. What kinds of work do hospice volunteers do? It differs from hospice to hospice. They usually spend a lot of time just sitting at the bedside of patients and listening and talking with them, although in some hospices this is discouraged. At one hospice in Kurume in Kyushu, the volunteers take care of flowers and prepare tea time so that patients have a reason to go to the communal room and enjoy each other’s company. I consider listening to patients to be very important — and also listening to their family members and offering some kind of grief care is very important. In what ways could Japanese hospices be improved? Having visited more than 200 hospices around the world, I have three suggestions for the further improvement of Japanese hospices. First, as in Australia and some European countries, they should hire full-time professionals in the fields of music therapy, art therapy, bibliotherapy, pet therapy, reflexology, massage, etc., because these roles are at present mostly filled by volunteers. A second suggestion would be to hire more hospice social workers. In Japan, in general hospitals, there are few social workers compared to America or Europe. And thirdly, I believe that patients’ spiritual care would be enhanced by training and hiring professionals in that field. At present, at quite a few Japanese hospices nobody is taking care of kokoro no mondai (problems of the heart). You have written that at hospices in Western countries, Christian priests talk to patients and pray with them. But in Japan, many people have no particular religious beliefs, so how is it possible to afford them spiritual care? In Japan, I have seen quite a few Christian hospices, and usually they have Protestant ministers, Catholic priests or Catholic sisters as spiritual-care professionals. But in public hospices with no connection to any religion there are usually no spiritual-care professionals. 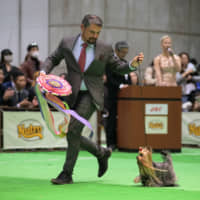 Of course, as you point out it is more difficult in Japan — but everybody, as a human being, has a spiritual dimension, and that is typically a search for the meaning of their life. Another basic theme of spirituality is to give and gain reconciliation to and from others. And everybody has spiritual pain, too. These issues are not sufficiently dealt with in many hospices in Japan, since nobody is in charge of the spiritual care. So I would suggest that some more training in spiritual care should be provided (to workers) at hospices. 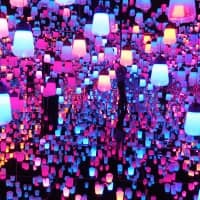 In Japan, some 350,000 deaths every year (around 30 percent of the total) are due to cancer, but more than 30,000 people have committed suicide annually for the last 13 years. Why do you think so many people kill themselves? The traditional idealization of suicide in Japanese literature, and the many suicides of famous literary figures has created an atmosphere in which suicide is seen as an honorable way out of a complicated situation. However, more education about the great pain that a suicide imposes on parents and families could probably reduce the number. It seems many people kill themselves or try to do so because they don’t see anything wrong with it. Please explain your view of the moral considerations surrounding suicide. In my lectures, I always tell people that we have received our life from our father and mother. Therefore, throwing away the precious gift that you have received offends your parents. Your parents spent years bringing you up and educating you, and they spent a lot of money on you. Therefore it’s ungrateful to commit suicide. Secondly, I always stress that suicide inflicts enormous pain on your parents and your whole family. 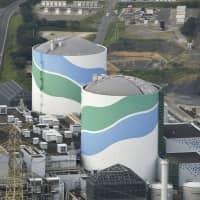 More than 20,000 people are dead or missing following the March 11 disaster in the northeastern Tohoku region. How can the victims’ families and others who loved them cope with their grief? The sudden deaths after the Great East Japan Earthquake and the tsunami have resulted in a complicated form of grief for many survivors. Many ask, “Why did my child or mother die and only I survive?” Grieving is a process, and the psychologist Sigmund Freud created a new word in German — namely trauerarbeit (literally, “grief work”) — since grief after the death of a loved one is not a mere passive suffering. The road to recovery demands that people do their own grief work. This work includes accepting the reality of death, learning to live without the deceased loved one, searching for a new meaning of life, acquiring a new identity, and rediscovering laughter and their sense of humor. The grief process is a long road. I have met numerous Japanese who, after the loss of a loved one, experienced a remarkable personality growth and are now working as volunteers helping others undergoing a loss experience. You have talked to many people who have lost loved ones. But how can people who lost their families and friends recover from their grief? Every week I give several lectures in different cities around Japan. Usually there are quite a few people in the audience who have lost a loved one. In a 90-minute lecture, I often spend 20 to 30 minutes explaining bereavement and grief. I have developed a 12-stage grief process that seems to be helpful. Many bereaved people have benefitted from attending the mutual support groups of the 50 chapters of the Japanese Association for Death Education and Grief Counseling [that Deeken founded in 1983]. In these groups, many discover that they are not the only ones who have lost a loved one, as other participants have gone through a similar painful loss experience. Since all group members are bereaved, they can listen with deep sympathy to each other’s experiences of loss. Learning how others face their losses and loneliness has often been a first step to a new encounter and friendship. Another typical phrase that can be unhelpful is naite wa dame (don’t cry). Crying is actually good. I even encourage people to express their emotions through crying. So, what can we say to grieving people to encourage them in a sincere manner? I always tell people not to say too much but to listen more. Most people who have lost loved ones would like to talk about it, and they would like somebody to listen to them. What is your message for people who continue to suffer due to the disasters in Tohoku? What I would urge people in Tohoku is to maintain hope in their future. Many have lost hope, but I want them to regain it. Hope is the key to a positive future. I had a very hard childhood during World War II, and that experience was absolutely terrible, including bombings. At the time, it was very painful for me. But when I look back on my childhood, I see it was also a positive experience because I can sympathize a little more with other people who are suffering. So I wish for the people in Tohoku not to lose hope, or regain it and look positively into the future.